I’m in between projects right now (not counting quilt tops that need finishing!) and picked up that adorable Alexander Henry house print at Joann’s a few nights ago. It was calling my name…Sophie needs a quilt made with it…stat. 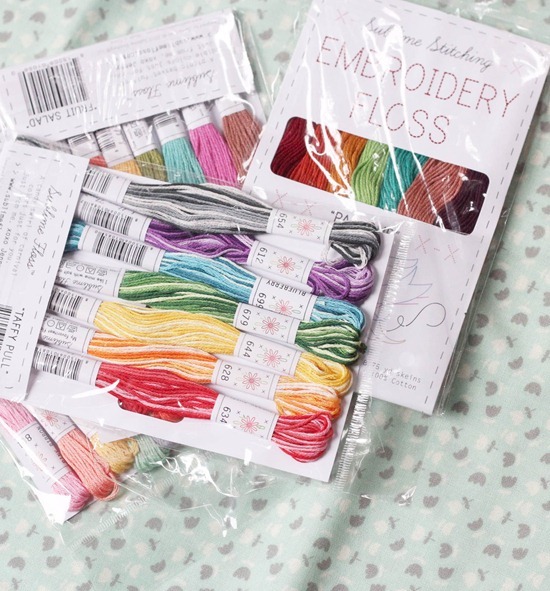 I got a lovely pack of Sublime Stitching embroidery floss in the mail last week. These color packs are so pretty. I want to bring a few with me to market this week and make this during the downtime. The boys and I made these little pillows with leftover fabric from their quilts. They are the perfect size to hit each other with. At least they are hitting each other with pillows though right? Usually it’s light sabers. That picture of Sophie is so cute! 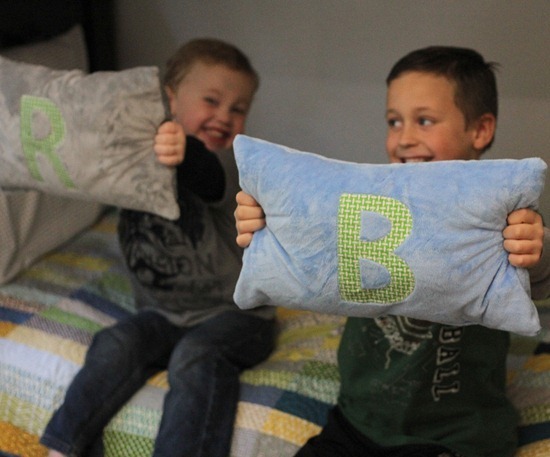 My kids can weaponize anything– thank goodness they're only pillows! The kiddos are darling. I picked up that same print along with the companion print titled 'flea market friends'. The little characters were just too cute. Maybe my grand-daughter needs a new quilt. We'll see. Hi Sophie… you are too precious. Love the smiles on your children and that house print is pretty! Id lIke to get some of that. Sophie is too, too, cute. I had two boys before I had my girl and so happy I did. So funny – light sabers are prominent in our home too! Very adorable house print fabric – I hear so much about Joann's that I think I would like a Joann's in Australia! That house print is too cute. I understand the absolute need for a quilt out of it. very cool – I bought the same Alexander Henry fabric at the new Joann's that I discovered about a month ago. The sweet receptionist told me about the store's mobile app which I downloaded while she cut my cute fabric! I have amnesia about how much I spent, but I saved a ton as they let me use as many paper & mobile coupons as I could present! What a beautiful family. Love the picture with your little girl helping you. She is on her way to becomming a sewer. Sophie is very yummy and your sons are gorgeous too. Enjoy them. Love that fabric from JoAnn's! well of course I had to order it too! Where will you be at Market? I'd love to meet you in person! I bought some of the same fabric last weekend but I had no idea it was Henry Alexander. That just makes me like it even more. I may have to go buy some more…especially since I have my extra 30% off coupon! I can't wait to see what you do with those yummy fabrics, and those threads, and the patterns..YUM! And may I just say, Sophie, is GORGEOUS! Wow your baby girl has grown so fast!! She's so beautiful, and I've been trying so hard to resist that fabric at joann's, I love what you have paired it with in that photo. And I'm also hoping to make that Sarah Jane embroidery, it's too cute not to! So, thanks for the tip on the thread packs! Your daughter is adorable…I'll look for you at market! I went in to Jo Ann's JUST for thread, and came out with two yards of that fabric too… and forgot the thread. It was perfect in every way!! I love that market stalls fabric too. I got some a while back, but don't know what I want to do with it so can't wait to see what you make! :) Have fun at market. Super fun pillows. Miss the light saber days. Wish I were going to market! :0) That would be so fun! I wonder if I grab a broom and promise to sweep, they would let me in. :0) Maybe one day. Your children are adorable! 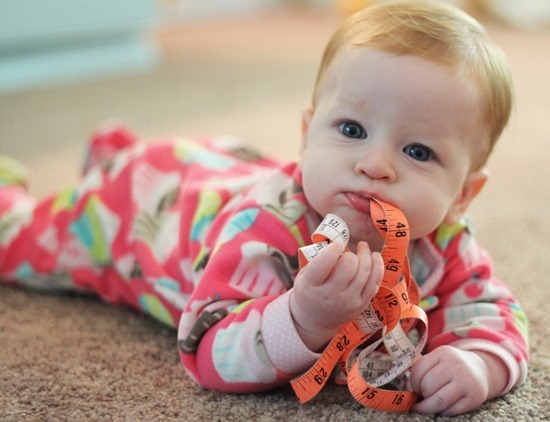 And that picture of Sophie with the measuring tape is so darn cute! that house print is so cute! And Sophie is too adorable! Love the house fabric! I'm feeling a bit overwhelmed right now. 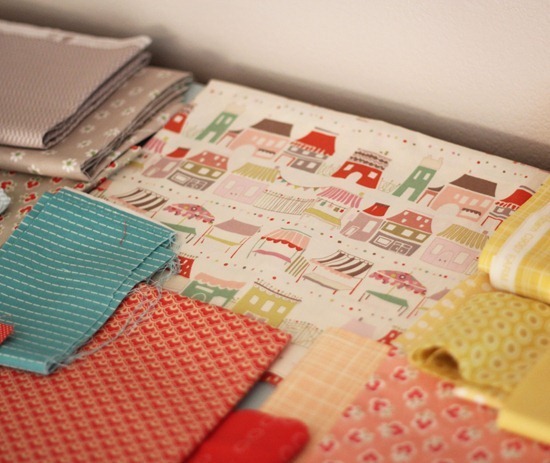 My sewing list keeps getting longer! Your pictures look very inspiring! Back to work! I'm going to JoAnn's this afternoon so I will HAVE to find this print. Don't have a girl yet though, so I'll have to find someone to make it for. Your boys sound just like mine. They are always chasing each other around with something. Light sabers was a few weeks ago. This morning it's Transformer weapons made with Duplo blocks.